“Milk & Honey ” is referred to in The Holy Bible (Exodus, 3:8) as a land that is abounding in all good things, or of extraordinary fertility. 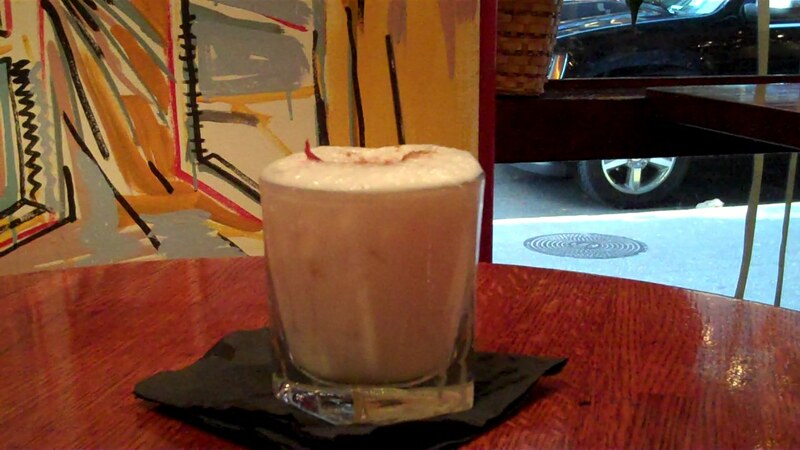 The yummy concoction pictured, named “Milk & Honey” was created a few years back with a very good friend of mine. It has been tweaked since the formula’s inception, but the magic ingredient will forever remain the same, Vermont maple syrup or Aunt Jemima if you prefer. You can also use actual honey instead of maple syrup, but I thought the name “Milk & Honey” instead of “milk and maple syrup” had more of ring, don’t you agree? It sort of resembles eggnog, but tastes like sweet vanilla ice cream, topped with a cherry and lightly sprinkled with cinnamon or powdered chocolate. It’s a heavenly cocktail that gently teases the palate minus the overpowering alcohol flavor and headache inducing sweetness. This cocktail is perfect for the novice drinker. Fill a rocks glass with ice, add vanilla vodka, maple syrup (or honey) and half and half. Shake rigorously, (should have a frothy consistency comparable to a cappuccino.) Top with a maraschino cherry, and lightly sprinkle with powdered cinnamon or chocolate. Enjoy! PS: The most powerful ingredient in every meal or beverage is love.